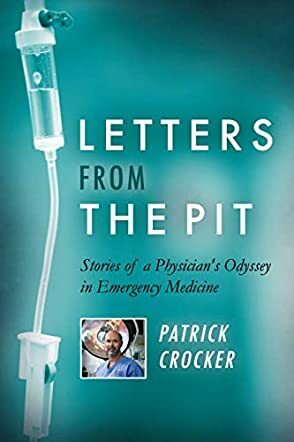 Letters from the Pit: Stories of a Physician's Odyssey in Emergency Medicine is a nonfiction memoir written by Dr. Patrick J. Crocker. Crocker’s idea for a book began with his plan, as a new medical student, to write a series of letters to his close college friend, Jack, who had always been supportive of Crocker’s plan to study medicine and had also been interested in the subject. While that project never really did get past a few letters, and those were never actually sent, the idea of having them form the basis for a book became a reality when Crocker retired after nearly 40 years as a emergency room doctor and, later, the medical director of emergency departments. Throughout the years of his practice, he was acutely aware of the basic concept of “doing no harm” to his patients, an aim that is particularly challenging in the emergency room where split-second decisions can be life-changing. His letters share both his triumphs and what he perceived as failures. Letters from the Pit is an illuminating and well-written look into a place where most people fear to tread. While there will always be the patient who really should have gone to their general practitioner sitting in the emergency room, the subject of emergency rooms automatically brings to mind life and death situations, all taking place in an alien and terrifying environment. Crocker’s letters brought a human element to that scenario for me. While still a place one would rather not find oneself, the author gave me insights into mindsets and motivations of the staff, of the professionals who put themselves in the Pit for the good they can do. As letters, Crocker’s chapters are written in an easy, conversational style that makes the reader feel as though the author is writing directly to them. His frank and genuine interest in his patients and their well-being comes out in every story. I especially enjoyed his first letter, which was not set in an emergency room but did involve an emergency of sorts when, as a new doctor fresh from his Obstetrics and Gynecology rotation, he is called upon to deliver a baby who wasn’t waiting a moment longer. That letter revealed him to be a person who could laugh at himself, and who easily shared his trepidation and utter confusion, and it had me instantly ready to follow Crocker as he shared the details of his practice. Letters from the Pit is most highly recommended. Here is a good new medical memoir told with equal parts of levity and gravity through intriguing case histories that together are a meditation on the oath all doctors take to "First do no harm". In exploring that, it shines a light into the gray areas of what it means to help. It traces the progress of a neophyte MD who puts a protective emotional distance between himself and his patients when the pain of loss and failure to fix things is too great to a mature physician who has learned the lessons of empathy and deep listening, trusting his instincts, focused attention despite myriad distractions, not settling for the easy or obvious answers. With full awareness of the costs, he is willing to engage on a human level knowing help does not go in all directions, that sometimes someone else pays the price. In solving the medical puzzles, Dr. Crocker uses rigorous critical thinking but also brings an ethical and emotional honesty that points to deeper lessons about what it means to do good by not doing harm. Really interesting read! Stories (chapters) are short enough to pick up and read 1 or 2 easily in a sitting, but they are also powerful and most will leave you with goosebumps at the end. This book also does a great job of putting the reader into the mindset of an ER doc by acknowledging and explaining things that you many don't realize these people have to think about while trying to make life and death decisions. Definitely recommend!